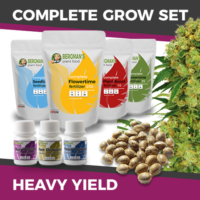 Offering exceptional value for money, the White Widow Marijuana Seeds Complete Grow Set contains all the seeds, nutrients and protection formula’s needed to produce a high quality crop. An easy to grow strain, producing healthy plants and large, potent buds from their highly stable, feminized genetics. Developed in the late 1980’s in Amsterdam, White Widow is a great strain for growing both indoors and outside, great for beginners, and one that flourishes with knowledge and experience, as well as perfect for both medical and recreational users alike. Every Grow Set contains all the nutrients needed for each stage of the plants lives. Individually packed. the four dry formula’s contain all the minerals, vitamins and nutrients necessary for strong, vibrant growth. Simply add pots, growing medium and water to begin growing your own White Widow marijuana. Shipped directly from I Love Growing Marijuana, one of the most trusted and respected providers of high quality marijuana seeds online, each purchase includes shipping and postal costs. Delivery is guaranteed, with a dedicated customer care service to answer any questions or concerns that may arise. Whether you’re new to growing marijuana, or a seasoned veteran, download the free, no obligation Growing Marijuana Guide E-book today. Packed full of information, growing techniques and tips to improve both the quality and quantity of your buds. 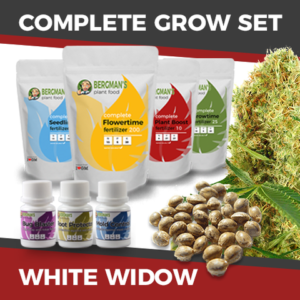 You can buy the White Widow Marijuana Seeds Complete Set, containing the seeds, nutrients and plant protection needed to produce a successful crop here. Take the guesswork out of growing marijuana, with all the help, advice and assistance you may need. Well known for both it’s high THC content and CBD levels, White Widow marijuana is a great choice for both medical and recreational users alike. Easy to grow and adaptable to many different techniques, it grows well both indoors and outside during the growing season. A powerful strain capable of growing between 80 cm – 120 cm tall, returning an average of 400 – 500 grams per square meter of incredibly strong Marijuana buds when grown indoors, and larger, individual plant yields when grown outdoors. Highly stable, it comprises of 60% Indica and 40% Sativa genetics. Each complete set contains 20 feminized seeds, guaranteed to germinate and produce the highest quality female plants. 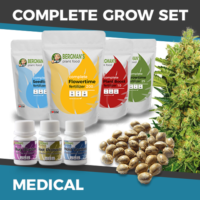 Shipped directly from I Love Growing Marijuana, a leading supplier of top-quality cannabis and marijuana seeds, every purchase is guaranteed to arrive, or replacements will be dispatched free of charge.